Twitter users should be no stranger to Donald Trump’s frequent controversial outbursts on this snap news platform. 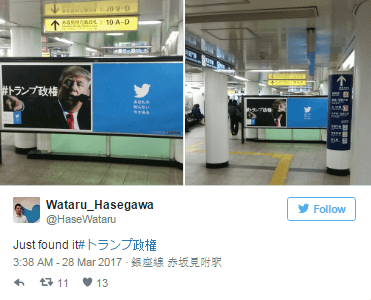 While some may find his quips offensive and crude, Twitter is actually leveraging his controversy in the form of huge billboards in Tokyo. This social network created billboards with Donald’s face on it with the mandarin inscription, トランプ政権 accompanied with the #TrumpAdministration. Translation? ‘There is a ‘now’ you don’t know about.’ This must be the reason we see more and more foreign trending hashtags on twitter. Honestly, when I log onto trends map it’s mostly gibberish these days. But hey, we move with the times so #陰陽師 . Check out the people’s reaction to this brilliant marketing campaign. Naturally Twitter has received severe criticism from its fans for the idea but aren’t controversial ones the most memorable marketing campaigns? Twitter admitted that Donald Trump had certainly increased the social platform’s visibility. The company is currently still struggling to grow its user base and revenue. Twitter CFO, Anthony Noto said during the company’s last earnings call that the campaign shows the power of Twitter and how the platform can be used. 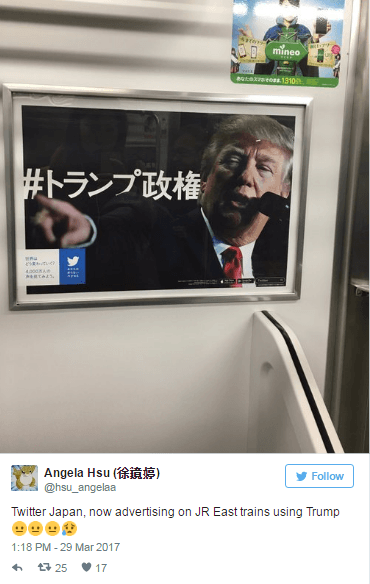 The campaign featuring Trump is targeted to Japan only and will run for two weeks. Mr Trump fold the FT that without his tweets he wouldn’t be where he was. He has over 100 million followers on social media and he does not have to resort to “fake media.” His 28.1million followers on Twitter alone kind of prove his point. Have you been following Donald’s latest tweets? If not, here are a few of the more controversial ones to remind you why exactly he has become, well, the face of Twitter in Tokyo. On the bright side, if the locals in Tokyo has anything bad to tweet about Donald, no one would understand the strange characters in their hashtags. We, albeit grudgingly, have to applaud Twitter’s latest marketing efforts and sheer brass. Who knows? Could this be Twitter’s saving grace or push them from the frying pan into the fire? Was this Twitter’s last trump card?